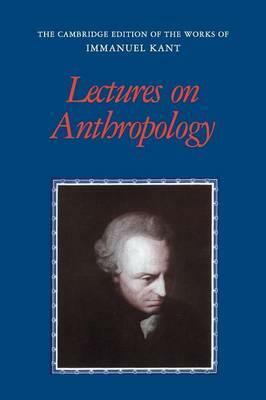 Kant was one of the inventors of anthropology, and his lectures on anthropology were the most popular and among the most frequently given of his lecture courses. This volume contains the first translation of selections from student transcriptions of the lectures between 1772 and 1789, prior to the published version, Anthropology from a Pragmatic Point of View (1798), which Kant edited himself at the end of his teaching career. The two most extensive texts, Anthropology Friedlander (1772) and Anthropology Mrongovius (1786), are presented here in their entirety, along with selections from all the other lecture transcriptions published in the Academy edition, together with sizeable portions of the Menschenkunde (1781-2), first published in 1831. These lectures show that Kant had a coherent and well-developed empirical theory of human nature bearing on many other aspects of his philosophy, including cognition, moral psychology, politics and philosophy of history. Introduction Allen W. Wood; Anthropology Collins (1772-3) [excerpts] translated by Allen W. Wood; Anthropology Parow (1772-3) [excerpts] translated by Allen W. Wood; Anthropology Friedlander (1775-6) [complete] translated by G. Felicitas Munzel; Anthropology Pillau (1777-8) [excerpts] translated by Allen W. Wood; Menschenkunde (1781-2) [excerpts] translated by Robert B. Louden; Anthropology Mrongovius (1784-5) [complete] translated by Robert R. Clewis; Anthropology Busolt (1788-9) [excerpts] translated by Allen W. Wood. Robert B. Louden is Professor of Philosophy at the University of Southern Maine. Allen W. Wood is Ruth Norman Halls Professor of Philosophy at Indiana University. Robert R. Clewis is Assistant Professor of Philosophy at Gwynedd-Mercy College. G. Felicitas Munzel is Associate Professor, Program of Liberal Studies, University of Notre Dame.